Create an application to contain the action files—hereby referred to as the Arc.js application. Set up the framework for the Arc.js application using the Kibo eCommerce ActionPack Generator for Yeoman, which generates the necessary project assets on your local machine. Use Grunt to build the project assets on your local machine and upload them to the Arc.js application in Kibo eCommerce. With the assets uploaded, install the Arc.js application to a sandbox in Kibo eCommerce. From within the sandbox, use the Action Management JSON editor to enable the functionality of the application&apos;s action(s). Enjoy the custom benefits of your action! Note: Once you are satisfied with an Arc.js application, you certify it and deploy it to production just as you would any other Kibo eCommerce application. Grunt.js—Provides a task manager that automates repetitive tasks. In this tutorial, you use Grunt to build your project files and upload them to the Dev Center. Git (optional)—Provides a version control system to manage your project files. When you set up your project files during the tutorial, you have the option of creating a Git repository for those files. Is configured with Arc.js. Contact your Kibo eCommerce representative to configure your tenant with the Arc.js framework. Contains a sandbox configured with a working catalog. To test your Arc.js application, you will view the live site on the sandbox, add items to the cart, and initiate the checkout process. The first step is to create an Arc.js application. This application will contain the custom function associated with the request shipping rates action. Later in this tutorial, you upload code to this application. After that, any sandbox to which you install this application benefits from the custom functionality. In the Dev Center Console, click Develop > Applications. Enter a Name and Application ID to identify your Arc.js application. To keep your applications clearly organized, it is a best practice to use the same name for both fields. Double-click your new application to edit it. Note the Application Key. You will need this value later in the tutorial. Nice work! You just finished setting up the necessary application in Dev Center. In the next part of the tutorial, you set up the project files on your local machine. Enter npm install -g yo to install the Yeoman tool. Enter npm install -g generator-mozu-actions grunt-cli to install the Kibo eCommerce extension for Yeoman. Create or navigate to the directory on your local machine that you intend to use as your project folder during development. Open a command prompt in this directory. Enter yo mozu-actions to run the Kibo eCommerce Yeoman Generator. Enter a name for your project. If you publish your Arc.js application on npm for public consumption, this is the package name that other people will see. Enter a description of your Arc.js application. Enter an initial version for your project or accept the default value in parentheses. Enter the Application Key for your Arc.js application. Enter the email address you use to log in to Dev Center. Enter the password you use to log in to Dev Center. Choose whether to create a Git repository for your project folder, if applicable. Specify a repository URL, if applicable. Choose a test framework. For this tutorial, choose Mocha. Enter Y to enable actions on install. This option saves you time by automatically enabling actions in the Action Management JSON Editor each time you install or update the Arc.js application. If you don&apos;t enable this option, you will have to manually configure the JSON code before your application takes effect on a sandbox. Select One (simple mode) when prompted. This option specifies that you only want to create one action file for actions that can run more than one custom function.Tip: If you ever want to take advantage of the ability of certain actions to run more than one custom function, select Multiple (advanced mode). You can then provide unique names for any number of functions attached to the action, separated by commas. For example, for an action that supports multiple custom functions, such as http.storefront.routes, selecting Multiple (advanced mode) and typing functionA, functionB, functionC creates three action files instead of one. The generator names the action files based on the function names you provide (ex: functionA.js) instead of defaulting to the name of the action (ex: http.storefront.routes.js) that the functions are attached to. In addition, the unique function names are automatically updated in the appropriate manifest file in the src directory. After you select your actions, Yeoman generates the necessary files in your project folder. Tip: If at a later point you want to add more actions to your project, open a command prompt in your project root and enter yo mozu-actions:action. This command lets you add additional actions to your existing project files without having to go through the rest of the setup prompts. Note that for the new actions to take effect, you have to either reinstall the Arc.js application to your sandbox (if you chose to automatically enable actions on install when you ran the Kibo eCommerce Yeoman Generator the first time) or manually update the Action Management JSON editor with the new actions. Also note that if Kibo eCommerce adds new Arc.js actions at a later date, you need to update the Kibo eCommerce Yeoman Generator before you can scaffold the newly released actions. To update the Kibo eCommerce Yeoman generator, use the npm update -g generator-mozu-actions command. Now that you have the necessary project files in place, add the code to return custom shipping rates any time a shopper goes through the checkout process. For the purposes of this tutorial, the custom shipping rates are retrieved by making an API call to an external random number generator and by accessing configuration data from the Action Management JSON Editor. These methods of retrieving shipping rates are not very practical but are useful for educational purposes, illustrating how you can utilize external services within Arc.js applications as well as obtain JSON configuration data from within your sandbox. The tutorial also demonstrates how you can leverage an external npm library to manipulate one of the shipping method labels. Within your project folder, navigate to the assets/src/domains directory to view the domain folders that Yeoman generated. Open the commerce.catalog.storefront.shipping folder, and then open http.commerce.catalog.storefront.shipping.requestRates.before.js for editing. This file corresponds to the action that manipulates the HTTP request and response when a shipping rate request occurs on your site. The following image shows the default code included in the file. Note that the code references an external library, &apos;flip-text&apos;. To install this library, open a command prompt and enter npm install --save flip-text. This command installs the flip-text library on your local machine and lists the library as a dependency in your project&apos;s package.json file. Within your project folder, navigate to the assets/test directory to view the test files that Yeoman generated. Open the http.commerce.catalog.storefront.shipping.requestRates.before.t.js file for editing. This file runs tests for the http.commerce.catalog.storefront.shipping.requestRates.before action. In your project folder, navigate to the assets/test directory and then open the embedded.platform.applications.install.t.js file for editing. This file runs tests for the action that occurs whenever you install the Arc.js application to a sandbox. That&apos;s it! You just coded your first action. Now it&apos;s time to build and upload the project assets to Dev Center. After coding the action&apos;s custom functionality, use Grunt to validate and build the project assets. If there are no errors, Grunt uploads the assets to Dev Center. Tip: To learn more about the available Grunt commands, click here. Open a command prompt in the root of your project folder. When prompted, enter the password you use to log in to Dev Center. Verify that the build is successful and that the files upload without errors. Expand the folders to view the uploaded files, which should match the assets on your local machine. Double-click a file to confirm any edits you have made. Looking good! With your assets uploaded to Dev Center, you can now install them to the sandbox of your choice. In Dev Center, open your Arc.js application to view its details. 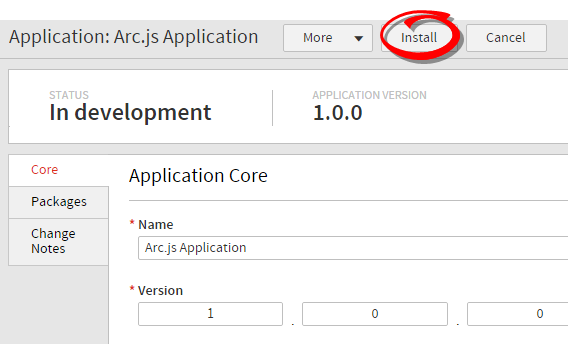 Select a sandbox to install the Arc.js application to. After a successful installation, open the Core tab. You can view which sandboxes you&apos;ve installed the Arc.js application to under Application installations. Almost there! After installing the application, you need to enable its functionality from within the sandbox itself. You complete this task in the next part of the tutorial. After you install the Arc.js application to a sandbox, enable its functionality from within the sandbox using Kibo eCommerce&apos;s built-in JSON editor. In short, this editor is where you specify which installed actions to enable, which configuration parameters the actions use, and which log level the actions write to. Under Application installations in your application&apos;s Core tab, double-click the sandbox to which you installed the Arc.js application. The sandbox opens to the Admin dashboard. Got to System > Customization > Arc.js to bring up the JSON editor. Because you chose to automatically enable actions when you ran the Kibo eCommerce Yeoman Generator, the JSON editor is prepopulated with the code required to enable the action, as shown in the following image, so you don&apos;t have to take additional steps to enable the action. However, you do have to specify the custom configuration data for your shipping rates, as detailed in the next section. Add a "configuration" array to the "customFunctions" array. This array provides configuration data to a specific function. If the data from this configuration conflicts with the application-level configuration data, the data from this configuration takes precedence. Add a "shippingAmount": 17 key-value pair to the array you created. Add an "applicationKey" field and a "configuration" array to the "configurations" array. This array provides configuration data to the entire Arc.js application. In the array you created, enter the application key for your Arc.js application and add a "shippingAmount2": 25 key-value pair. Congratulations! 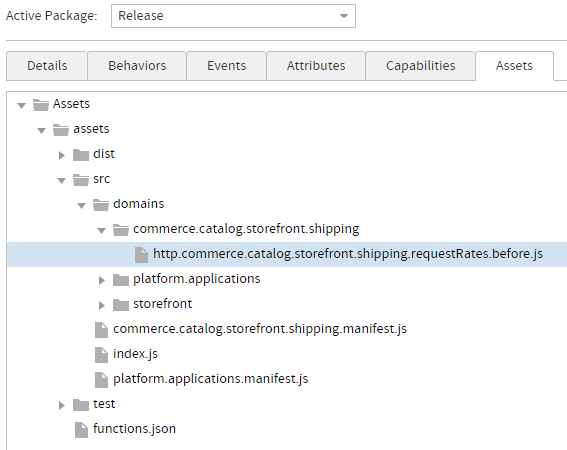 You added configuration data that the request shipping rates action can access and are now ready to test the custom functionality of your Arc.js application. Right-click the sandbox you installed the Arc.js application to and click View. Hover over your site and click View Live Site. Enter your shipping information and then click Next. When you view the shipping methods, you now see the three custom rates generated by your Arc.js application. Well done! That was Arc.js in a nutshell. You should now be ready to create more advanced functionality in Kibo eCommerce using actions. Remember to leverage the reference help as you create your own Arc.js application.